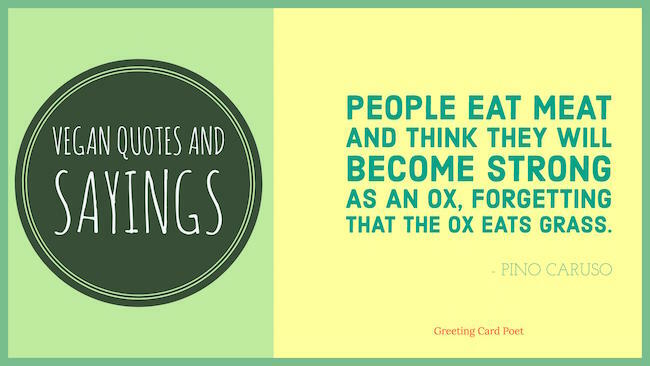 If you look at the history of vegan quotes and vegetarian sayings, they go back decades. There have been dozens of famous personalities from all fields who have emphasized the importance of veganism and vegetarianism, embraced it and encouraged others to follow. Some of the most famous names include Benjamin Franklin, Carl Lewis, Mike Tyson, Martina Navratilova, Pamela Anderson, Ellen DeGeneres, Albert Einstein, Natalie Portman, Russell Brand, Leo Tolstoy, Alicia Silverstone, Bill Clinton, Mahatma Gandhi, Thomas Edison, Steve Jobs, George Bernard Shaw, and Leonardo da Vinci. Here are some compelling Vegan and Vegetarian Quotes to encourage and inspire you to make the world a better place. You can also share these quotes and sayings with friends and loved ones to encourage them too. 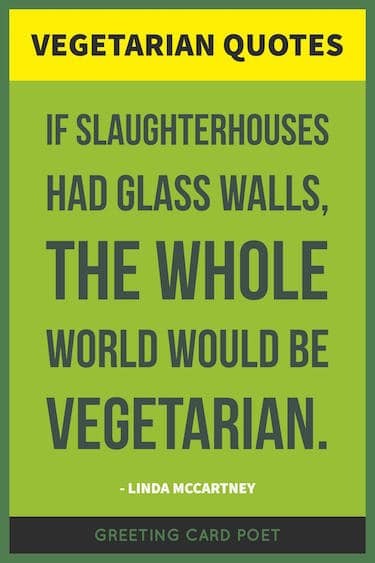 If we each had to butcher our own meat, there would be a great increase in the number of vegetarians. Being vegan helped me realize I can say and do what I believe is right. That’s powerful. I made the choice to be vegan because I will not eat (or wear, or use) anything that could have an emotional response to its death or captivity. With lentils, tomatoes and rice, olives and nuts and bread, Why does a man care to gnaw a slice of something bleeding and dead? When people ask me why I don’t eat meat or any other animal products, I say, because they are unhealthy and they are the product of a violent and inhumane industry. Give up animal foods for two months, or even for a week, and I promise you will look and feel better, and you’ll want to do it forever. 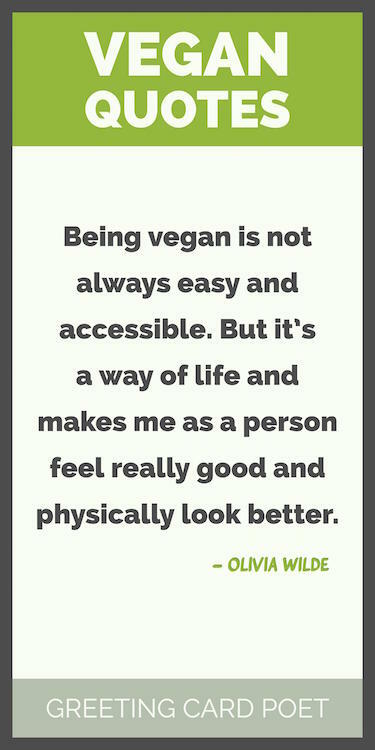 When you adopt a vegan diet we make a connection, you don’t go back, it is not a diet, it is a lifestyle. I’m a vegan. It makes me feel really good and bright. 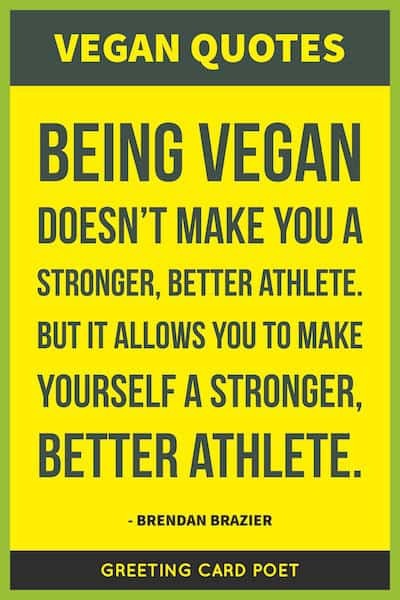 Being vegan doesn’t make you a stronger, better athlete. But it allows you to make yourself a stronger, better athlete. Per Authority Nutrition, “These people chose not to consume dairy, eggs or any other products of animal origin, in addition to not eating meat like the vegetarians.” Read more about Veganism. 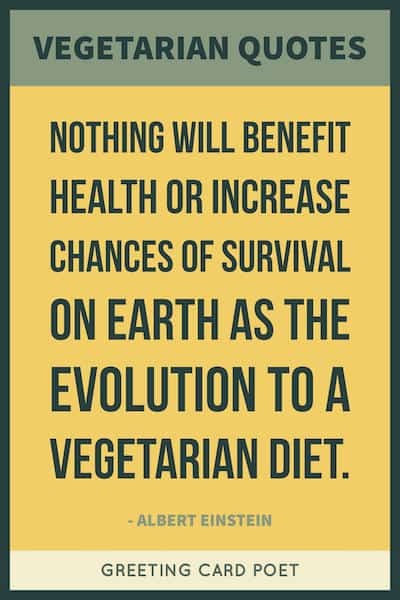 Vegetarianism preserves life, health, peace, the ecology, creates a more equitable distribution of resources, helps to feed the hungry, encourages nonviolence for the animal and human members of the planet, and is a powerful aid for the spiritual transformation of the body, emotions, mind, and spirit. Anyone who cares about the Earth – really cares – must stop eating animals. I became a vegetarian after realizing that animals feel afraid, cold, hungry and unhappy like we do. No animals need to die in order for me to live. And that makes me feel good. A vegetarian in Texas. You’re a long way from home. It is more important to prevent animal suffering, rather than sit to contemplate the evils of the universe praying in the company of priests. Tip: Consider using these vegan quotes as photo captions in social media like Instagram and Facebook. Albert Einstein, one of the most famous scientists in history, turned vegetarian after having supported the concept for decades. There are a few famous vegetarian quotes from the German-born physicist. If you have suggestions for vegan quotes and vegetarian sayings, please let us know via the Contact page. Thanks. You’re on Vegan Quotes and Vegetarian Sayings page.